Former president, Olusegun Obasanjo, has said anybody who will lead Nigeria to the promise land will have his support in 2019. The past ruler made the statement at his residence in Abeokuta, Ogun state, on Thursday, July 26, when a presidential aspirant of the Peoples Democratic party (PDP), Kabiru Tanimu Turaki, paid him a visit, The Nation reports. 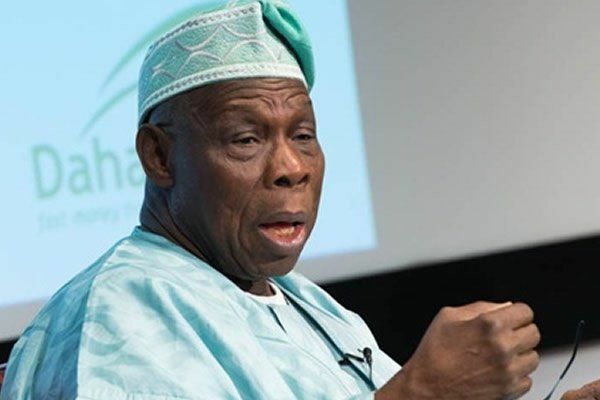 Obasanjo said Nigeria is not short of leadership having listened to the speeches of Turaki and Boni Haruna, the director general of the Kabiru Tanimu Turaki campaign organisation. “Listening to you, I believe you have got the concerns of Nigerians today in the area of security, economy and cohesion. Anybody who will lead Nigeria to the promised land will have my support,” the former president said. Speaking on the backdrop of the siege laid to the residences of the Senate president and his deputy, Obasanjo said he feels embarrassed by a number of things happening in the country especially in these days that the social media could post them in real time. He stated that a nation can be destroyed not necessarily when people are doing bad things but when people keep quiet when danger looms. Meanwhile, the national chairman of the All Progressives Congress, (APC), Adams Oshiomhole, has described politicians who defected from the ruling party as men without honour. The APC chairman made the statement while reacting to recent defections that has plagued the party at a meeting with party members in the House of Representatives on Thursday, July 26, The Tribune reports. He said the recent defections gave credence to his earlier view that the Peoples Democratic Party (PDP) was bereft of a guiding ideology, which he claimed gave room to people without honour to be accommodated. The APC chairmen said the aggrieved politicians who left the ruling APC were not comfortable with President Muhammadu Buhari’s anti-corruption crusade.